Although the effect of trade on employment is a popular point of economic debate, there are very few factual assessments available. This book examines the most recent evidence and provides guidance for the design of tools to assess more accurately the employment impacts of trade. Trade and Employment argues for strengthening the micro-foundations of models used to evaluate the employment effects of trade and for including the informal economy and adjustment processes in modeling efforts. It emphasizes the role of governments in helping firms survive or grow, in providing social protection to protect against external shocks, in addressing gender equity, and in building physical infrastructure and human skills bases that facilitate export diversification. 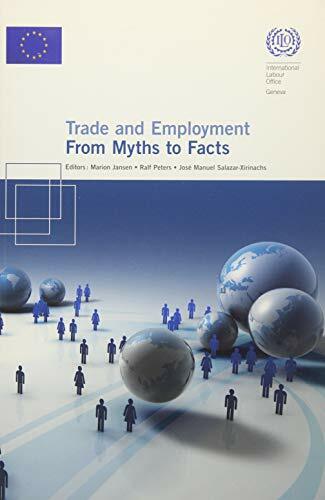 It is a valuable resource for all those interested in the debate on the employment effects of trade: workers and employers, academics and policymakers, and trade and labor specialists. Marion Jansen is counselor at the Economic Research and Statistics Division, World Trade Organization. She is coauthor of Trade and Employment in the Global Crisis (ILO/Academic Foundation, 2010) and coeditor of Making Globalization Socially Sustainable (ILO/WTO, 2011). Ralf Peters is economic affairs officer in the Division on International Trade in Goods and Services and Commodities, United Nations Conference on Trade and Development. José Manuel Salazar-Xirinachs is assistant director general for policy at the International Labor Office and coauthor of Promotion of Sustainable Enterprises (ILO, 2009).